If you wish to know your Lord in a deeper way, you are invited to join the vast host of Christians who, over three centuries, have turned to this book more than any other - except the Scriptures - in order to begin that journey to the depths of Christ. Imagine a book that is 300 years old and has never been out of print! Such is the book you see on your screen. Other than Pilgrim's Progress, there is probably no other piece of Christian literature that has stood the test of the centuries so well. 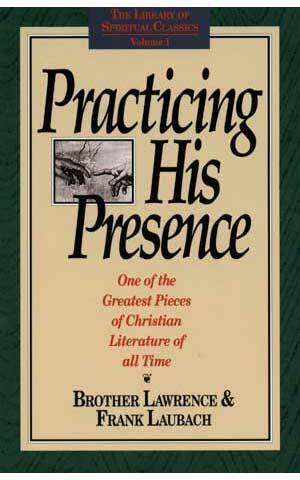 An estimated 22 million copies of the original The Practice of the Presence of God have been printed in the English language alone. In recent years, however, interest in this book has waned as the original English edition became so outdated that it was virtually unreadable. The publishers have now revised and reissued this book under the title Practicing His Presence and the profundity, depth, and beauty of Brother Lawrence's masterpiece lives again! We have also included in this edition, not only the letters of Brother Lawrence - from the 17th century - but also those of Frank Laubach - from the 20th century - who, like Brother Lawrence before him, wrote a series of letters chronicling his experiences in practicing the presence of Jesus Christ.